There are a whole host of nonprofit conferences coming up, and if you plan on attending any of them, you have to be prepared. Some conferences are smaller affairs that host only a hundred people. Others are massive, multi-day extravaganzas with multiple events going on from morning to night. Both types of conference have their merits, and you and your nonprofit team can benefit from attending the option that fits your particular needs. Whether you want to brush up on your fundraising strategies or learn how to more effectively use social media to communicate with donors and volunteers, there is a conference out there for you! 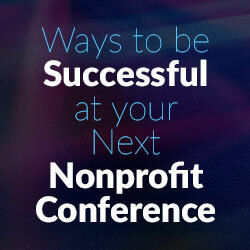 Here are ways to be successful before, during, and after you attend a nonprofit conference next year. Many conferences have strict deadlines and offer discounts the earlier you register. The sooner you can get your foot in the door and reserve your spot for an event, the better! You probably don’t need to (and shouldn’t!) bring your entire staff to a conference. Once you’ve determined which event you’re going to and how much it costs per person, decide who would benefit most from attending. If the conference is for seasoned professionals, it’s probably not a good idea to bring the office intern along. Many conferences have a dedicated Twitter handle, a hashtag, an Instagram account, or a Facebook page. Connect with other conference attendees on these platforms to ask questions and get more info. This is especially helpful if you’ve never been to a conference before. You can ask others for advice on anything from dress code to how to prepare for networking events to help you get ready for the conference. A lot of the sessions at these conferences start early in the morning. Don’t hit the snooze button and miss out on valuable information! Take notes and ask questions during sessions and events. Obviously, don’t spread yourself too thin, but try to absorb as much as you can. Many conferences offer an expo hall that plays host to vendors marketing their products and services to nonprofits. While it’s tempting to just wander around and take advantage of the free swag and literature that the vendors offer, take the time to stop and talk to a few of them. They might be selling something that your nonprofit could benefit from. When you find someone that you connect with, give them a way to get in touch with you later. Handing out your business cards can help you establish meaningful relationships with other nonprofit professionals and expand your network. After a long day of sitting and listening to speakers, your first thought might be to retreat to your hotel room and catch up on your favorite TV show. Resist the temptation to leave quickly and stick around for some of the optional, less formal networking events. These can be a great way to meet new people and talk about the earlier sessions. Stay connected with the conference attendees and vendors on social media and through email. Keeping in touch with the people you meet at nonprofit conferences can lead to innovative ideas and strategies in the future. They might be able to help you brainstorm your next fundraising event or give you great donor acquisition tips. Nearly all nonprofit conferences are annual or bi-annual. If you had a particularly good time, make plans to go to the next one. Your nonprofit can only benefit from all of the good ideas and information that these conferences afford. If you’re known as the “fundraising expert” or the “social media guru” at your organization, it might be worthwhile to sign up to speak at a conference the next time you attend one. The application process differs from event to event, but if you’re passionate about sharing your knowledge with other nonprofit professionals, warm up those vocal chords and sign up to be on the other side of the podium. Nonprofit conferences have endless advantages, and you and your nonprofit team should definitely consider attending one soon. Whether you go a couple cities over or halfway across the country, attending a conference and getting out of the office can help you find a fresh perspective on your job and your organization’s strategies. Jack Karako has 30 years’ experience within the charitable and philanthropic industry that he brings to the forefront with IMPACTism. Jack has been a major gifts fundraiser and senior organizational executive working with or consulting to nonprofit and advocacy organizations. A generous community and civic leader who has served on several nonprofit boards, Jack has a unique perspective as a donor, benefactor, and as an industry thought leader. Working closely with senior leadership in strategic planning, Jack has personally raised over $50 million in annual and deferred gifts. Jack has a Master of Business Administration (M.B.A.) degree from Florida Atlantic University (Boca Raton, Florida), Master of Arts (M.A.) degree from American University (Washington, D.C), and a Bachelor of Arts (B.A.) degree from State University of New York at Geneseo.